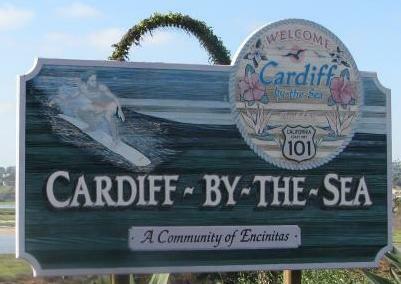 Cardiff is a beach community located in Encinitas, bordering Solana Beach to the south. It operates as part of the city of Encinitas but has its own zip code (92007) unlike other communities there. It is such a classic southern California beach town that I just had to do a page about it. There are two miles of breathtaking Pacific coastline views, world-class surfing and a 900 acre ecological reserve. Cardiff offers both walk-out level sands and scenic bluff vistas. It is home to numerous surf competitions. George's is located just south from the San Elijo Lagoon river mouth and is a very popular spot. Its also know as "Restaurant Row", where right above the beach on Highway 101 you'll find the Beach House and the Chart House. Cardiff Reef is on the south end of the campground where the cliffs end. it is a sweet little surf spot with a cool little beach park. San Elijo State Beach and Campground. Campsites sit on top a scenic bluff. There is a store, showers, toilets and beach access for surfers and swimmers. No water or electric hook ups. Call 800-444-7275 for reservations. The camp store is located near the entrance and operates March through October. It has mostly all the amenities a camper may need including firewood, boogie boards and RV supplies. This is also the home to the original Bull Taco. You can reach the camp store at 760-436-6601.